After what’s been termed the “transport from hell” due to problems with vehicles and people, Bubba from rural Kansas finally arrived Thursday at 10:30 p.m. We met him at I-70 and Tower Road (affectionately known as “Saudi Aurora”) … waaay east of Denver proper and at least an hour from our place in north Loveland. Suffice it to say it was well after 1:00 a.m. by the time we got home, pottied dogs, played musical crates, and had the dogs settled in for the night with the thunderstorms rolling low in the distance. Note to self: order a Thundershirt for Frankers. While waiting for the vet to come in and do the rescue exam the following morning, I finally got a really good look at Bubba. Both eyes are badly infected and with hyperpigmentation of the eyes and the skin around the eyes. I first suspected something amiss while watching him around the yard that morning … he moved like my Dad’s blind Tzu, cueing on sounds. Flip the ear leathers back and it’s obvious he’s got yeast and/or bacteria going on with abundant ear hair … hot, red, tender to the touch and inflamed. During exam of his mouth, I note the front lower incisors cannot be seen. Probing reveals a wad of hair completely covering the teeth. 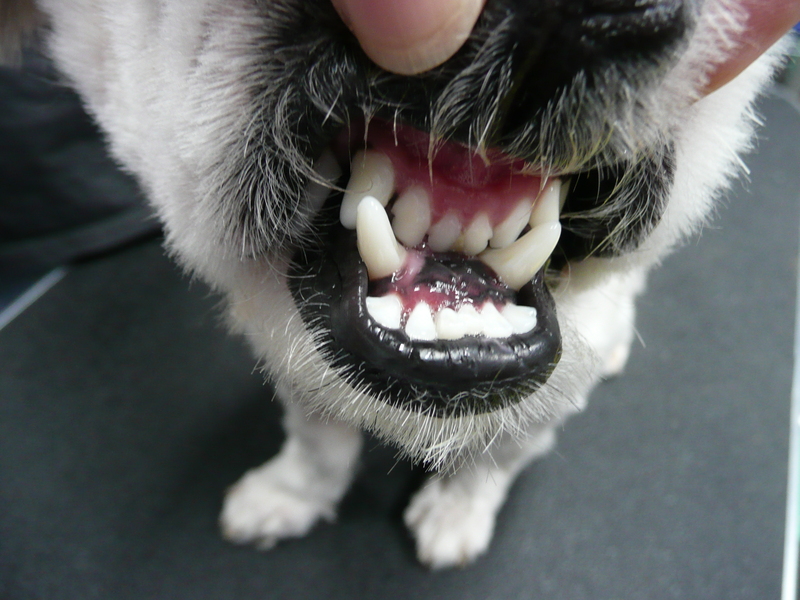 I manage to pull it off and up pop five very white incisors, indicative of a young dog. My guess, less than two years of age. I’m betting the chewing at his tail/rear is where he picked up the hair in his teeth and it’s been there a while based on the odor. More surprising, however, is his bite — or lack thereof. His jaws are mismatched and he has an underbite of at least 1-1/4 inch. So much so that the top incisors rest on the lower jaw instead of meeting up with the upper incisors. 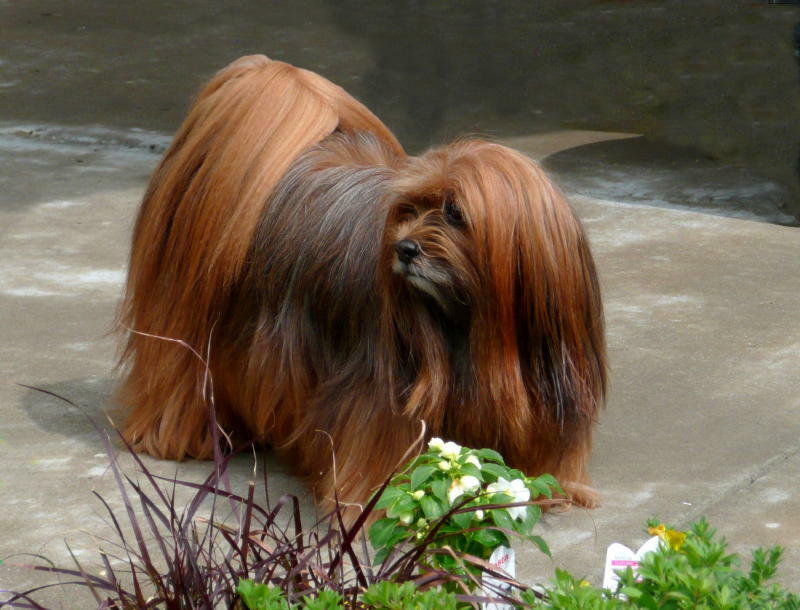 While Apso are supposed to have an underbite, this is utterly obscene — and especially so knowing that someone is breeding these malformed dogs for a profit. The vet walks in and immediately starts laughing, all the while apologizing. Po’ Bubba … he’s a damn pitiful sight with a story and a haircut to match. I have to wonder if there wasn’t some message with the tying him to a fence post. Unlike many of the breed, Bubba is exceptional during the exam, sitting or standing quietly while he’s poked and prodded. 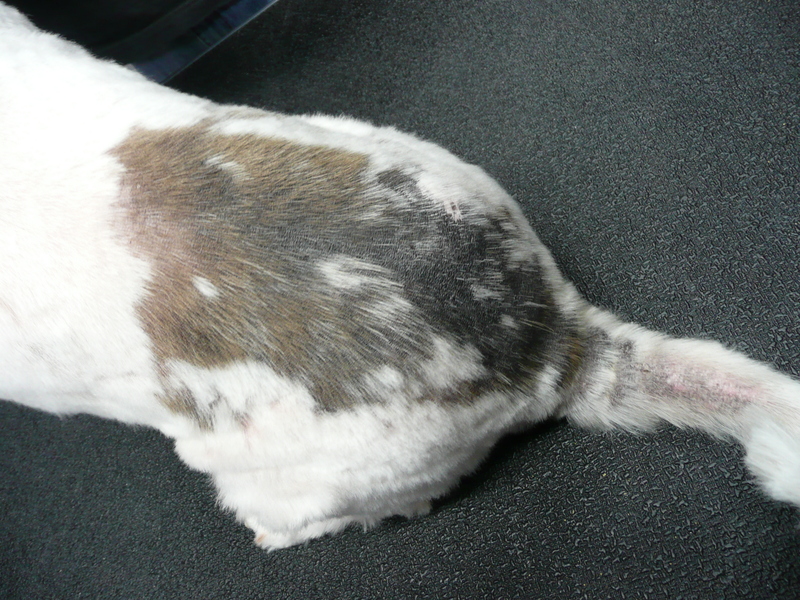 Final diagnosis: eyes and ears are infected, a bit of demodex (causing the skin issues), and dermatitis. We’re loaded up with antibiotics, eye drops, ear ointment, and Advantage Multi to get the demodex in check. While there, he’s wormed and a microchip implanted. Instructions are given to return in three weeks for follow-up; the eyes are a bit worrisome as it could be KCS or “dry eye,” requiring a life time of daily eye drops. The vet is hopeful that once the eye infection is cleared up along with the skin issues, the eyes will start producing tears normally again. He’s not contagious as his problems stem from a compromised immune system so he’s fine to interact with the other dogs in the home. Ongoing treatment, high-quality food and lots of rest should get him back on his feet. A good haircut with a pair of clippers should help with the “ugly.” But, then again, maybe not. This after he got a good bath and we took him down to less than a quarter inch to even his haircut up. Awwww, Bubba … you need some hair! What Bubba lacks in beauty, he more than makes up for with his sweet temperament and ability to get along with the other dogs in the house. Surprisingly, he arrived crate trained, sleeps through the night quietly, and is house trained. Innately adaptable, he’s doing quite well after being moved to his foster home and is enjoying his walks around Lake Estes every morning. 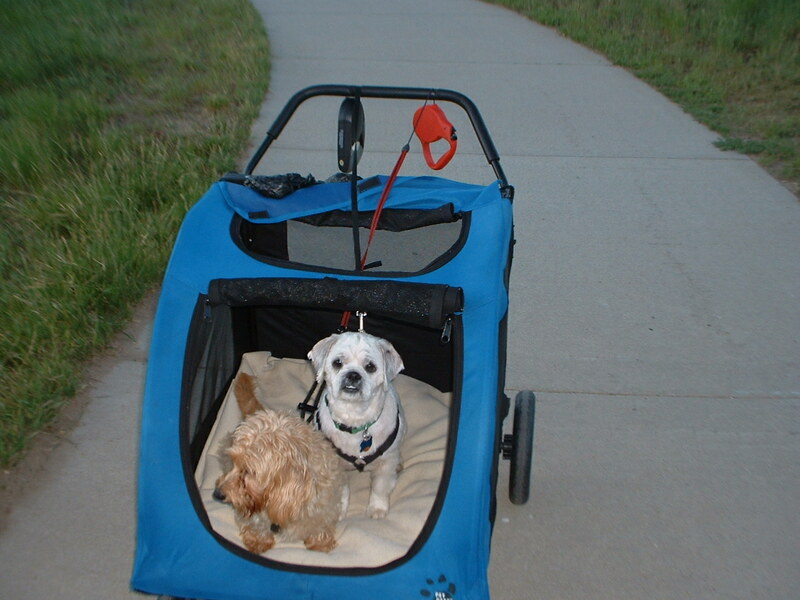 When he tires out, he gets to share the stroller with little Ollie, who has bad hips. Here’s to a new life in the West!